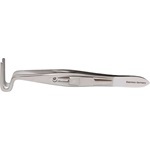 Berke Ptosis Forceps have a curved tip with straight, longitudinal serrated blades. 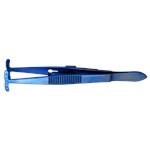 Flat, serrated handle with slide lock. Available in 20mm or 27mm jaw length. Titanium. Three pins and holes on each 22mm paddle. Angled shafts bent 10mm from tip. 1 x 2 teeth.